My weekly printable meal planner – saves money, time and nerves! You don’t need kids to get asked the all time favorite question “what’s for dinner?” on a daily basis. I personally ask myself every day, and every day I don’t know what the heck is for dinner. Not that we don’t buy plenty of ingredients, but we end up with pretty much the same dish three times a week: green beans, potatoes and some sort of meat. Yawn. No matter how much you love a dish, it does get boring after a while. 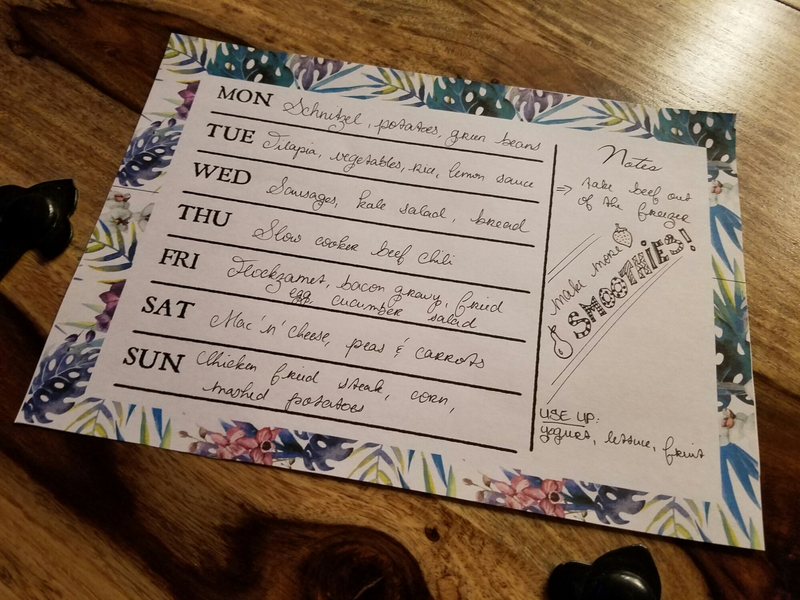 So to tackle two of our kitchen problems – “what’s for dinner?” and “oh crap, this and that expired, we forgot to eat it” – I created a printable meal planner that helps us to shop more consciously and eat more balanced and healthy – to make the wallet less slim and keep ourselves well fed! I made my own printable meal planner because none of the ones I found online was perfect for us. Most of the time they had too many extra cells I didn’t need, for example a shopping list, or it was segmented into breakfast, lunch and dinner. I only wanted to plan our dinners and have one additional cell for notes, for example when to pull something out of the freezer, what has to be used up, and general things to remember. This week’s plan was built around a lot of things we have in the freezer. As you see, today’s dinner was our favorite: potatoes, green beans and meat, in this case a good German Schnitzel! Tuesday we will use up some frozen tilapia we have, along with all those bits and pieces of vegetables that always seem to be left over after cooking, like leeks, more green beans, and tomatoes. My husband asked for rice as a side and I’ll make a lemon butter sauce to go with it. Wednesday we will eat sausages, another favorite of ours, with a kale salad, made with dried cranberries and pecan nuts, and some bread at the side. Thursday we will use some beef that we have left over from smoking a several pound piece of beef brisket. I cut it up and portioned it, vacuum sealed it and put it into the freezer to have ready whenever we want to enjoy this delicious smoked piece of cow again. I’ll make a slowcooker beef chili, maybe with some lettuce turned into a salad at the side. Friday I decided on a dish from my hometown Lauscha in Germany. You probably won’t find it elsewhere as it is a very regional and traditional dish for the part of the Thuringian Forest my family is from. It is Flockzamet, a sort of mashed potatoes, but more dense as you add potato starch to it. I’ll top it with chives, bacon and onion sauce (also a very traditional, “old” German thing), a fried egg, and I’ll prepare some cucumber salad as a fresh and crisp side. Saturday it will be a meatless dinner of mac’n’cheese and peas and carrots. And Sunday my husband requested a chicken fried steak with mashed potatoes and corn! I never made chicken fried steak, but I’m eager to learn this American recipe- I ate it before and I loved it, although it was very unusual for me to eat a piece of breaded beef, nobody in German would ever think of this, haha! Under “Notes” I wrote down that I have to take the beef out of the freezer on tuesday, and that we have to make more smoothies! They’re the easiest way for us to eat more fruit and vegetables. We’re not the type of person to make ourselves a big plate of cut up fruit and eat it with delight, so smoothies are great to get in some of our five a day! A big portion of vegetables had to be part of every dinner too, so I planned accordingly! I also noted what we have in the fridge that has to be used up this week, namely yogurt (which I’ll use for the cucumber salad dressing, and smoothies), lettuce (as a side for the beef chili), and fruit (smoothies!). Putting the plan together just took me about 10 minutes, including looking through fridge, freezer and pantry. And it will save us a lot of time and nerves for the rest of the week! Plus, we know exactly what to buy now and won’t pack the shopping cart with things we maybe might eat some time this week (and end up never eating). 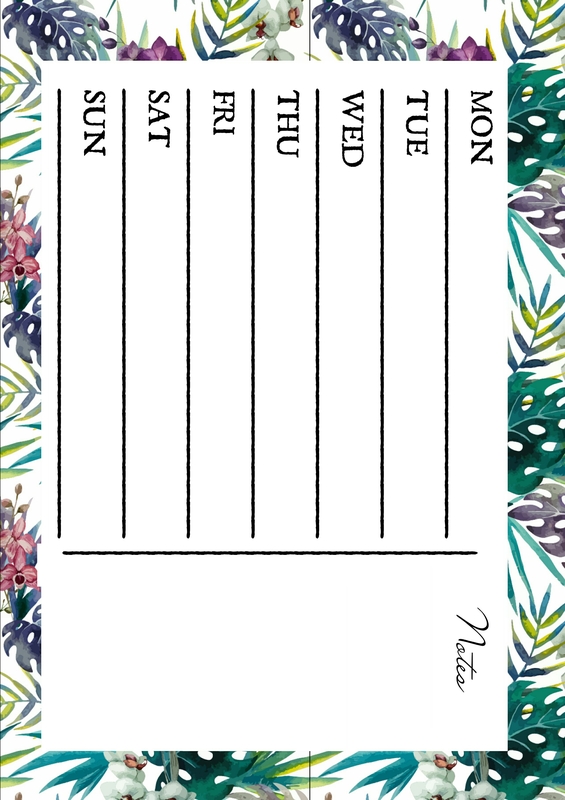 If you want this meal planner for yourself, feel free to print it out! What are your favorite meals to make for dinner? 5 Responses to My weekly printable meal planner – saves money, time and nerves!